Don’t toss that leftover pickle juice after you finish your pickles. Use it with summer herbs to make pickle juice salad dressing. 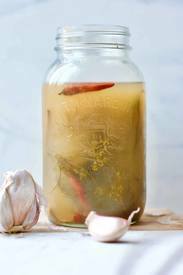 When using fermented pickle juice, you are adding more beneficial bacteria, enzymes and nutrients into this pickle juice salad dressing that’s both delicious and refreshing.